Mickey Rourke and Faye Dunaway deliver outstanding performances in this cult classic. Barfly is a semi-autobiographical account by American poet, novelist and short story writer Charles Bukowski of his days hanging around bars in Los Angeles, drinking heavily. Though set within this grimy world of down-and-outs, the film manages to be noble and humorous throughout. 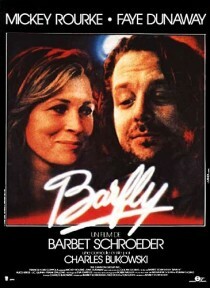 For director Barbet Schroeder, Barfly was a labour of love. A fan of Bukowski’s, Schroeder commissioned him to write the screenplay; but it took eight years to get the film made. Schroeder finally secured funding from Cannon Films by threatening to cut-off one of his own fingers with a battery-powered saw if they would not deliver. Bukowski’s “Hollywood” on the struggles of creating this movie was way more entertaining than the movie itself! One of my favorite films. I saw Barfly in 1995 at the age of seventeen. It struck a cord with me. I recently saw “Bukowski: Born into This and liked it WAY better…I don’t think Mickey Rourke’s portrayal of Bukowski was at all convincing, or accurate…Charles did himself much better! When this came out I was 27 and working at a mostly repertory cinema, so your post is tickling memories. I didn’t like it much, though Mickey Rourke tends to fascinate me. There was another film around about that time based on Bukowski’s writing called ‘Love is a Mad Dog from Hell’ which I much preferred. What a great title! This is another on my husband (at the time) tricked me into seeing. I didn’t know much about Charles Bukowski and this film didn’t do much to make me like him. My husband identified with him on a personal level and I did understand why after watching it. lol BUT I’d always liked Mickey Rourke! As I recall, Faye Dunaway’s performance was pretty awesome. I’d watch it again to see how I liked it now that I’m older.